After 6 days at sea, we finally sighted land, Franklin Island, with it’s glacial snow cap looked like Eden after the roller coaster ride of the Ross Sea. Franklin Island. Photo Anton van Helden, copyright Te Papa. Franklin Island is home to a large colony of Adelie penguins and is the hangout for a few Weddell seals. Weddell seals generally live by the fixed ice where males will vociferously defend their breathing hole against other males. Not here though, here they were hauled out on the beach and adjacent snow clad rise. 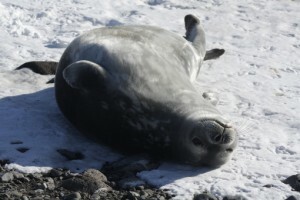 Weddell seals are quite a deep diving seal, with known dive depths in access of 700m. This species was once hunted around Ross Island. Weddell seal. Photo Anton van Helden, copyright Te Papa. Weddell seals were harvested in small numbers and used to feed sled dogs on the Antarctic stations. But they are considered to have recovered to pre-exploitation numbers. 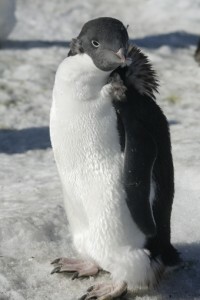 Moulting Adelie penguin. Photo Anton van Helden, copyright Te Papa. The Adelie penguins that were present were moulting, and much like the king and royal penguins on Macquarrie Island were largely unphased by our presence. They were however somewhat wary of the Antarctic skuas. A number of penguin carcasses had been meticulously pecked over and reduced to clean bones by the skuas. 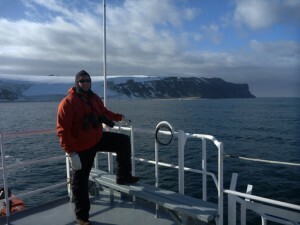 We are now at about 76 degrees south and heading further south towards McMurdo sound. Sightings of some 50-60 Killer whales in the region has a number of the crew pretty excited, me among them!